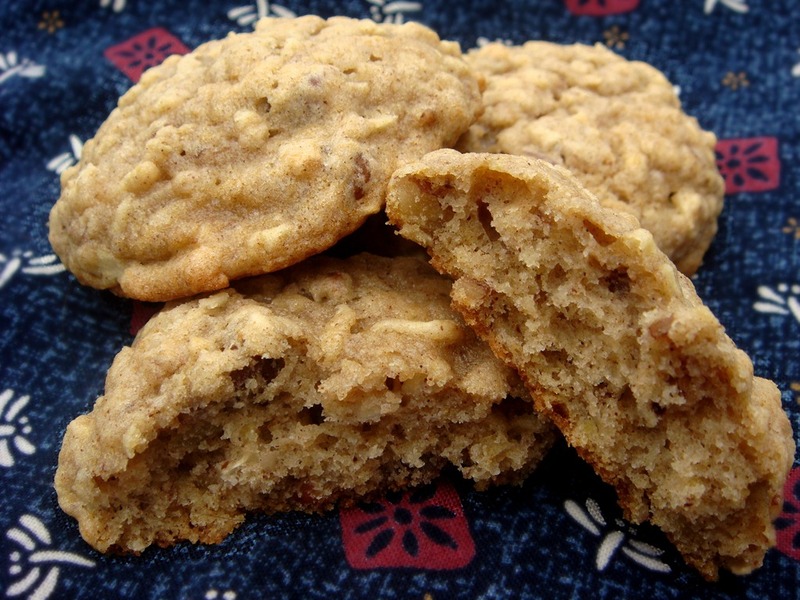 This spiced oatmeal cookie dough has finely chopped apples added. And delicious apple-pie spices. The apples keep the cookies soft and moist. They are almost like a cross between an oatmeal cookie and an apple cinnamon muffin. I like to store extra cookies in the freezer, as the tops become slightly sticky when left at room temperature, similar to the texture of muffins when stored at room temperature. Raw apples in the dough can cause a few difficulties when baking. The longer the dough sits, the more the apples leach moisture into the rest of the dough. If you bake the dough immediately after mixing, you may need to flatten the dough slightly before baking. But if you bake the cookies one baking sheet at a time, by the time you get to the last batch, the dough is very soft and the cookies will spread much more while baking. The best advice I can give is to scoop the dough onto multiple cookie sheets and bake several pans at a time. This is when I really wish I had double-ovens. If your dough does become too soft, just stir in an extra tablespoon of flour or two, and they should bake fine. Preheat oven to 350°F. Line a baking sheet with silicon mats or parchment paper. In a small bowl, stir together flour, baking powder, baking soda, salt and spices. In a mixing bowl, cream together butter and sugars until light and fluffy. Beat in egg and vanilla extract. Add dry ingredients to mixer bowl and beat until mixed; mix in oats. Add apples and pecans and mix until combined. Dough should be baked immediately. Do not store dough in refrigerator to bake later; the moisture from the apples will affect the texture of the dough. Bake for 10-12 minutes, until cookies begin to brown at the edges. Cool for about 5-6 minutes on the baking sheet, then transfer to a wire rack to cool completely.